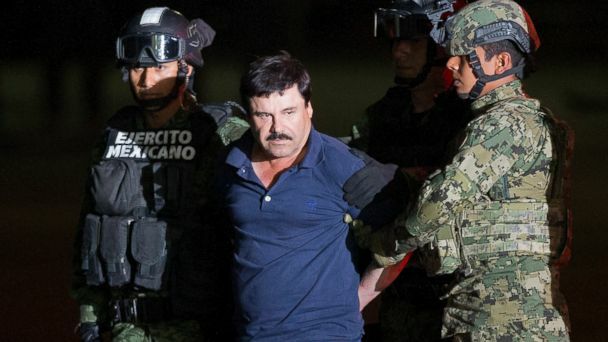 Mexican President Enrique Pena Nieto tweeted Friday that the infamous drug lord known as "El Chapo" has been captured after months on the run. "Mission accomplished: We have him. I want to inform the Mexicans that Joaquin Guzman Loera has been detained," the tweet, which is written in Spanish, states. A U.S. law enforcement official also confirmed his capture to ABC News. Following a news conference Friday night, Guzman was walked by police in front of cameras at an airport in Mexico City and then was placed in a helicopter bound for Altiplano, the same prison where he escaped from six months ago. Attorney General Arely Gomez confirmed at that press conference that the address where Guzman was captured had been monitored for a month. According to Gomez, Guzman managed to escape with his lieutenant through the drainage system of the city. They opened one of the drains and got out on a main road in Los Mochis and stole vehicles to escape. Since the navy was around the area - and after hearing reports of stolen cars - authorities managed to locate the vehicles and detain both Guzman and his lieutenant. The authorities took them to a motel to wait for reinforcement of security forces to take them to Los Mochis airport and then transfer them to Mexico City. According to Gomez, one of the leads that authorities used to locate Guzman was his intention to film an autobiographical movie, and that meetings occurred between Guzman's lawyers and actresses and producers. At a news conference Friday afternoon, the Mexican president said that the drug kingpin's capture followed months of intelligence work. He hailed Guzman's capture as a sign that Mexico can overcome corruption. An official from the Mexico Marines confirms to ABC News that Guzman was captured after a shootout in the city of Los Mochis, in the state of Sinaloa, this morning. Earlier Friday, The Associated Press reported that five people had been killed and six people were arrested when the Mexican Marines raided a house in Sinaloa. The AP has since spoken to a Mexican law enforcement official who confirmed that Guzman was captured in a different raid at a nearby motel. There have been other raids in Sinaloa in recent months as part of the search for Guzman, the AP said. Guzman, 57, escaped from the Altiplano prison near Mexico City July 11 and there has been an active manhunt for him ever since. When guards realized that he was missing from his cell, they found that a ventilated tunnel had been constructed and had an exit via the bathtub inside Guzman's cell. The tunnel extended for about a mile underground and featured an adapted motorcycle on rails that officials believe was used to transport the tools used to create the tunnel, Monte Alejandro Rubido, the head of the Mexican national security commission, said in July after Guzman's escape. Guzman had been arrested five months prior to the July escape. He had escaped before from a prior prison stint, also using a tunnel. Anne Laurent and The Associated Press contributed to this report.Get real-time updates as this story unfolds. To start, just "star" this story in ABC News' phone app. Download ABC News for iPhone here or ABC News for Android here.